Coins of this series are sold to the public at their legal tender face value of $20. Maximum mintage of the release is capped at 225,000 with a household order limit in place of just three. This series has proven extremely popular with the public and has led to complete sell-outs. Interest in the series is high owing to the varying designs, the precious metal content and, of course, the fact that each can be purchased for just $20 - their legal tender face value. All coins of the program feature the same basic specifications including a composition of 7.96 grams of 99.99% pure silver. This gives each coin a weight of just slightly more than a quarter of an ounce. Each features a diameter of 27mm. The RCM strikes each coin to specimen quality. 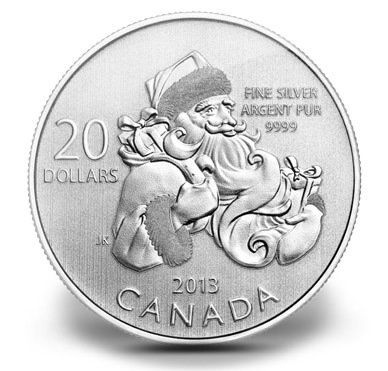 Offered on the reverse of the new 2013 $20Santa Fine Silver Coin is a portrait of Santa! The design is the work of Canadian artist Jesse Koreck and shows the jolly fellow with his sack of presents over one shoulder and a wrapped present being held in one arm. Inscriptions include CANADA, 2013, 20 DOLLARS, FINE SILVER ARGENT PUR 9999. The obverse contains Susanna Blunt's effigy of Queen Elizabeth II. Obverse inscriptions include ELIZABETH II and D G REGINA. Each coin is presented in a protective pouch attached to an illustrated display card. For more information, or to place an order visit the Royal Canadian Mint's online store at http://www.mint.ca/store/.